Proxy Browser is a new third party browsing app for Android that makes it easier for people on restrictive Wi-Fi networks to access the data and services they want, right from their smartphone or Android tablet device. Blocked websites on public networks can often be an irritating problem. Whether you are away at college and find some websites like Facebook or YouTube are blocked, or in a foreign country where social networks and Google are prohibited, finding a way around such road blocks can be a big problem. A new Android app aims to make the process of bypassing such blocks as easy as possible. Called Proxy Browser and costing absolutely nothing, the app offers a web browser which makes accessing YouTube, Facebook and Google as easy as it should be – putting an address in an address bar, that’s about it. Privacy browser is an android browser developed by Smartwebs Innovations to help the android users to unblock the websites blocked by the college wireless networks and also to unblock the sites blocked in the country. 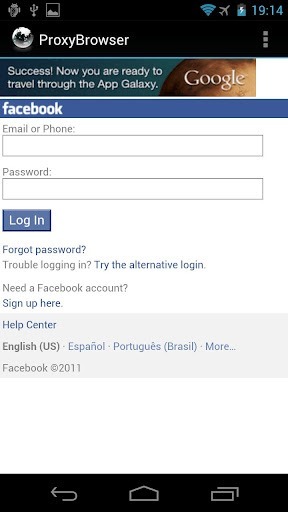 This app is 100% compatible with Facebook mobile and YouTube. 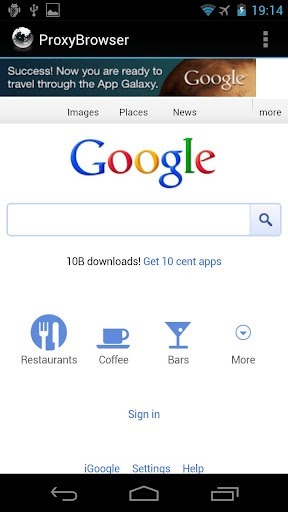 The app itself offers some more features, too, which may be of use to some depending on what they are looking for. According to the app’s developer, Proxy Browser will make your IP address invisible to those who are looking for it, as well as removing your browsing history instantly. By using proxy servers, Proxy Browser effectively makes you invisible as you go about your business across the web. Tellingly, the app’s developers point out that they will not be held responsible for how its users take advantage of Proxy Browser, suggesting they are well away of its possible nefarious uses. That said, if you just need a way to get around blocked websites, or perhaps need to change your browser’s user agent to access some online video content, then Proxy Browser could well be the app to check out. For the bargain price of free, there’s no real reason to not give it a try. A note for those that don’t like the ads in Proxy Browser, too – there is an ad-free version available to download from Google Play Store, should that tickle your fancy. Is there one which would not let any kind of tracking by any website? omething that doesnt let anyone – especially Google – monitor your online activities?